What makes Honda’s line of FourTrax Rancher ATVs so famously admired? Where do we start? For countless thousands of ATV owners, the Ranchers just hit that sweet spot. Big enough to tackle big jobs or adventures, week in and week out. Nimble and light enough to be maneuverable in tight terrain, and not wear you out after a day in the saddle. Affordable. Reliable. And the list goes on and on. Every Rancher starts with the same proven Honda engine, the heart of any ATV. A 420cc liquid-cooled single-cylinder design with fuel injection, it’s engineered for the kind of wide, low-revving power an ATV rider wants. And it offers something no other ATV can: Honda’s legendary reliability and efficiency. And here’s another big plus with a Rancher: With a wide range of models, it’s easy to pick the exact Rancher that’s perfect for you. We have models with independent rear suspension (IRS) for excellent handling and a superior ride. We also have swingarm/solid-axle models suited to riders who tow a lot, or who want a solid axle’s simplicity of design. Standard manual ATV transmission, our exclusive Electric Shift Program, or Honda’s revolutionary Automatic Dual Clutch Transmission (DCT) are all available, as is Electric Power Steering and your choice between two- and four-wheel drive. Innovation, performance, value, long-term reliability—the Honda Ranchers offer it all, and more. It’s an ATV partner you can count on, for years and years to come. HONDA PHANTOM CAMO®: A favorite option for many riders, our exclusive Honda Phantom Camo® is a treatment that helps your ATV blend in to a wide range of environments. AVAILABLE ELECTRIC POWER STEERING (EPS): Electric Power Steering helps eliminate bump steer and lessens steering effort, especially over rocks, logs and on sidehills. Honda’s system is second to none. There’s no pump, belts, or hoses to fail. Plus you get more boost when you need it: when you’re in four-wheel drive, at lower speeds and in rough conditions. REVERSE LEVER: The Rancher’s reverse lever is simple, easy and intuitive to use. 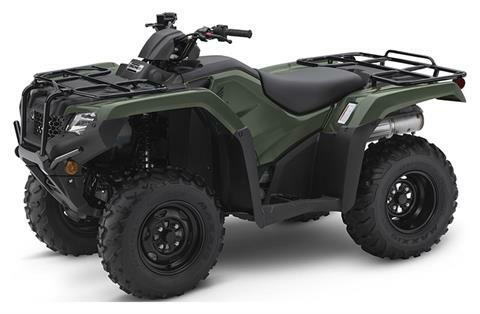 AVAILABLE ELECTRIC SHIFT PROGRAM: The convenience of push-button shifting with the rugged design of a conventional ATV transmission—that’s what you get with Honda’s exclusive Electric Shift Program (ESP). Just push one button to upshift and one button to downshift. It’s a big plus when you’re wearing heavy work boots or overshoes, or riding in mud or snow. An added benefit: you get genuine compression braking for better speed control when operating in steep terrain. IN-TANK FUEL PUMP: The Rancher incorporates an in-tank fuel pump for cooler pump operation, and long pump life. SEMI-DRY-SUMP ENGINE DESIGN: Compact and lighter-weight, the Rancher’s overhead-valve, semi-dry-sump design creates an engine that's shorter from top to bottom. That returns two big benefits: it enhances handling by lowering the engine's center of gravity, and it also allows for better ground clearance. PROGRAMMED FUEL INJECTION: Being able to count on crisp performance and starting under any conditions is a must for anyone who depends on their ATV. Thanks to Honda's Programmed Fuel Injection (PGM-FI)—featuring a 34mm throttle body, 12-hole Denso injector, and an oxygen sensor that allows the fuel mapping to instantaneously adjust to any riding condition—the Rancher not only ensures trouble-free operation in the cold and at varying altitudes, it reduces emissions and enhances fuel efficiency. A COMFORTABLE SEAT: A plush seat and open rider triangle (bar/seat/pegs) teams up with the suspension to really treat you right. Superior ergonomics have always been a Honda priority, and the Rancher is no exception. With thick, soft foam, it’s exceptionally comfortable. SWINGARM REAR SUSPENSION: On select Rancher models, the rear swingarm incorporates an enclosed, solid-axle design for strength and rigidity. When you need to tow a heavy load, the swingarm eliminates rear suspension squat as the load is placed on the axle itself, not on the rear shock. DISC BRAKES (RANCHER IRS MODELS): Rancher IRS models offer disc brakes all around for excellent braking performance. UTILITY ATVs ARE RECOMMENDED ONLY FOR RIDERS 16 YEARS OF AGE AND OLDER. ATVs CAN BE HAZARDOUS TO OPERATE. FOR YOUR SAFETY BE RESPONSIBLE. READ THE OWNER'S MANUAL. ALWAYS WEAR A HELMET, EYE PROTECTION AND PROTECTIVE CLOTHING. BE CAREFUL ON DIFFICULT TERRAIN. ALL ATV RIDERS SHOUD TAKE A TRAINING COURSE. (FREE FOR NEW BUYERS. ASK YOUR DEALER OR CALL ASI AT 800-887-2887). NEVER RIDE UNDER THE INFLUENCE OF DRUGS OR ALCOHOL, ON PAVED SURFACES, ON PUBLIC ROADS, WITH PASSENGERS, OR AT EXCESS SPEEDS. NO STUNT RIDING. RESPECT THE ENVIRONMENT WHEN RIDING. FourTrax and Rancher are registered trademarks of Honda Motor Co., Ltd.